Vanguard is an investment management firm that serves personal investors with a broad range of offerings, including low-cost, market-index mutual funds and ETFs, discount brokerage services, and advisory services. The company is owned by its clients (who own Vanguard funds) so investment costs are relatively low. The company's founder, John (Jack) Bogle, launched market-index mutual funds for individual investors through Vanguard. The company remains a leader in index investing through its mutual funds and ETFs but also offers actively managed funds and facilitates investing in individual stocks and non-Vanguard funds through its brokerage service. Learn about the mutual fund company and brokerage firm in this review. Vanguard does not offer Health Savings Accounts (HSAs); however, the HSA plan you choose may offer Vanguard funds as an investment option. Typically, investors can design their own portfolios for regular brokerage accounts, IRAs, and UTMAs/UGMAs. College savers using 529 plans can choose among a menu of pre-established portfolios. The minimums are $1,000 to invest in mutual funds and $3,000 to open a brokerage services account, making the entry point at Vanguard one of the highest hurdles among discount brokers. At $1,000 for the mutual funds, I can invest in Target Retirement funds, which are mutual funds comprised of mutual funds; for example, Vanguard Target Retirement 2040 Fund (VFORX) contains Investor Shares of Vanguard Total Stock Market Index Fund, Vanguard Total International Stock Index Fund, Vanguard Total Bond Market II Index Fund, and Vanguard Total International Bond Index Fund. At this price point, I can also buy shares of the Vanguard STAR Fund, also a fund of funds that provides broad market diversification and a 60/40 mix of stocks and bonds. A $3,000 investment will go much further, allowing me to buy a next-level tier of market index and actively managed mutual funds. Plus, as I mentioned earlier, I can open a brokerage account to purchase stocks, ETFs, bonds, and CDs (note that the brokerage account is distinct from the mutual-fund accounts). Vanguard's proprietary mutual funds and ETFs have extremely low expenses and are free of transaction fees, except in a few cases. Four of the mutual funds (investment-grade bonds, international bond, and global real estate index) have purchase and/or redemption fees of 0.25-1.00%. The firm charges an account maintenance fee of $20 annually. But I can typically avoid this fee if my fund or account balance is $10,000 or more (or $3,000 or more with a 529 plan); or I sign up for electronic delivery of statements. The price of stock and non-Vanguard ETF trades vary, depending on the assets held with Vanguard. The standard fee is $7 but trades are just $2 for clients with assets of $500,000 or more and free for those with $1 million or more. Through the FundAccess program, I can buy non-Vanguard mutual funds. No-transaction-fee funds do not incur charges but I'll pay $50 for shares held 60 days or less. To buy or sell transaction-fee funds, there is a $35 fee; however, this charge is less if I attain Voyager status or higher. I'll pay 0.30% of assets under management if I meet the $100,000 minimum balance and engage a financial advisor through Vanguard. Services under this arrangement involve investment management, including construction of an investment portfolio, implementation of tax-efficient strategies, and periodic portfolio reviews and rebalancing. Many brokerages and investment firms allow (and even encourage) regular investing through automatic deposits to purchase specific mutual funds or make contributions to an established investment portfolios. 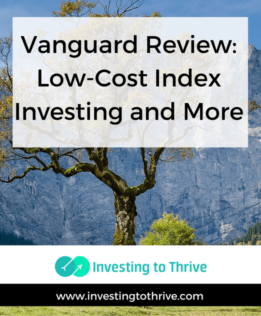 Vanguard often refers to this process as dollar-cost averaging rather than automatic investing. In terms of logistics, there are two main ways that people invest: 1) lump-sum investing in which you invest a lump sum (say $5,000) for a certain price at a given moment; and 2) dollar-cost averaging in which you make periodic investments and buy shares of a security at various prices so that the cost of shares is averaged among the various prices on the purchase days. Many people who cannot afford to make large purchases at one time invest a set amount each month (or other interval), so they dollar-cost average by default. Vanguard charges a $3 fee on dollar-cost averaging transactions for transaction-fee mutual funds. Vanguard's website contains resources that can be valuable to the investor. Most of the content is focused on larger issues, such as saving and investing for retirement, college, and other life goals; constructing and managing a broadly diversified portfolio; tax planning; and spending from your retirement funds. There are also practical tools, such as mutual fund and ETF screeners, calculators that can help determine whether to convert a traditional IRA to a Roth IRA, and ETF portfolio recommendations based on responses to questions about time horizon and risk tolerance. Stock investors may also discover valuable insights for research, starting with an easy-to-use-but-detailed screening tool along with information relating to company financials, analyst and business news reports, price histories and more. So, even though the interface is low key, much of the information needed to make a stock buy or sell decision is available on the site. The Vanguard: Personal Investors website and the structure of the firm's investment fees and minimums are designed to appeal to the long-term, buy-and-hold investor, particularly one who largely favors low-cost, market-index funds. An active trader focused on individual stocks (with an account balance less than $500,000) may not derive significant value from Vanguard services. But those just getting started (with a few thousand dollars) who want to own Vanguard mutual funds and ETFs may enjoy the easy and low cost of investing directly with Vanguard. Investors with a larger net worth may like the inexpensive (or even free!) stock trades, further saving money on fees.